Congratulations! If you received an official Outskirts Press EVVY Nomination invitation, this is how you accept your nomination, move one step closer toward winning an EVVY Award and perhaps even win the Outskirts Press Best Book of the Year Award along with its $1,500 Grand Prize! Your first step is ordering this EVVY Awards Submission option. This covers the cost of your paper work, the contest, and the copies of your book that we have to send to each judge. Scroll down to Product Details for more information. Every year, Outskirts Press nominates approximately 5% of the books published during the course of the previous year for official submission to the EVVY Awards, sponsored by the Colorado Independent Publishers Association. Official EVVY Award nominations are hand-picked by Outskirts Press executives and members of the production teams, and these nominations represent the very best of our yearly publications. Being invited is a huge accomplishment. Congratulations! But don't stop now. To accept your nomination and enter the awards, you must order this optional service. To learn more about how we select our nominees, read this blog by the Outskirts Press CEO, Brent Sampson. 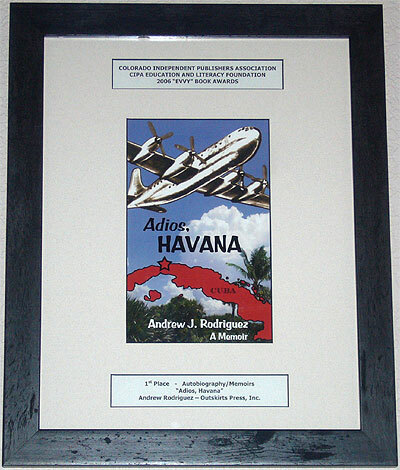 The EVVY Awards recognize excellence in independently published books. Sponsored by the Colorado Independent Publishers Association (CIPA), the EVVY Awards are judged by a panel of professionals on a qualitative scale of merit in approximately twenty different categories. All Colorado publishers who are members of CIPA are eligible to enter for recognition and awards. Every year, Outskirts Press wins more EVVY Awards than any other participating publisher. First, second, and third place winners, along with "Merit" winners, are recognized in each category. Outskirts Press will most likely, but is not obligated to, announce finalists and/or winners in one or more of our on-going marketing efforts, like the email newsletter, on our Facebook page, and/or via press release distribution. Potential Outskirts Press nominees are notified via email. If you wish to accept your nomination, you must complete your order from this screen. This fee includes the EVVY Award submission fee through CIPA, the cost of all the judges copies of the book, shipping & handling, and the completion of all the submission forms on your behalf. Outskirts Press may, but is not obligated to, consult with the author on the most appropriate category to enter. While there is no obligation to accept the nomination, you must accept it if you want Outskirts Press to submit your book to the EVVY Awards. The EVVY Awards fee becomes non-refundable once ordered. Winning an EVVY Award is a prerequisite to winning the Outskirts Press Best Book of the Year Award and its $1,500 Grand Prize! EVVY-winning Outskirts Press books are automatically considered for the Outskirts Press Best Book of the Year Award for no additional cost. Learn more about the Outskirts Press Best Book of the Year award (including previous winners) by clicking here. EVVY-Award Winners are announced each spring during a banquet dinner celebration in Denver, Colorado. The 3 Best Book of the Year finalists are announced shortly thereafter. Like all book contests, the EVVY Awards are very competitive and only the highest-caliber books are recognized from the publisher's submissions across the state. Unlike other book contests, however, fewer than 200 total entries are usually submitted, increasing the statistical odds that an Outskirts Press Official Nominee will be recognized as an award-winning publication. If your book is nominated to be an official Outskirts Press nominee, you will receive an email from us informing you of the good news. At that point, you must complete your nomination order to accept your nomination and move ever closer to an EVVY Award and perhaps recognition as the author of the Outskirts Press Best Book of the Year! Good luck!